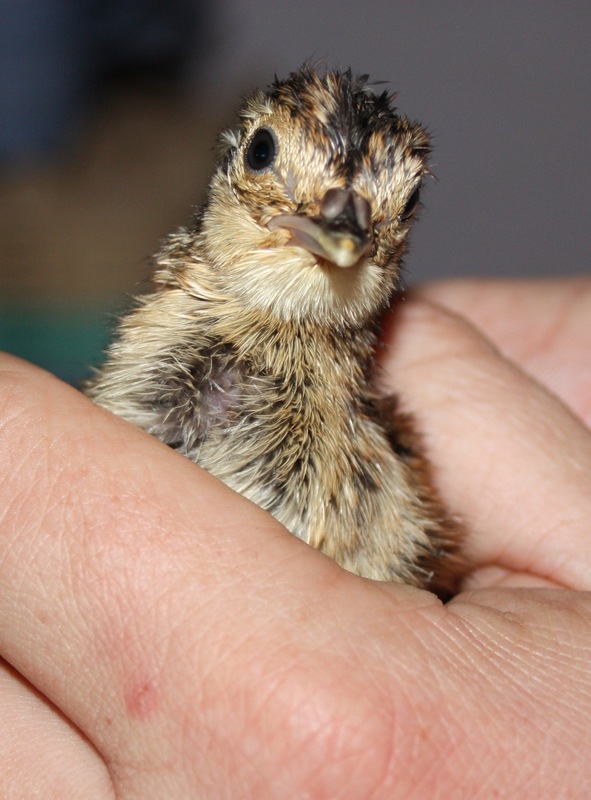 One of the few: the first of the pheasant chicks destined for the new release pen on the Chayne. After twenty four days in the incubator, my pheasant eggs suddenly showed fruit this morning. The early trouble with a power surge appears to have killed the overwhelming majority of eggs during the first thirty six hours, but after candling and scanning eggs for the past fortnight, we were able to filter out the majority of duds. The disasterous start did mean that a tiny number of eggs have hatched, and supplementary day-olds will have to make up the numbers when I finish work on the new release pen up on the Chayne. This little blighter (pictured above) has been peeping all day in the incubator while his companions hatched. I have worked as a ‘keeper in the past, and while none of this pheasant rearing process is particularly new to me, doing it on such a small scale is letting me see the whole process at first hand and in great detail. When you are responsible for thousands of day-old pheasant chicks, you don’t have time to sit and watch their behaviour and marvel at the literal magic of incubation. After around six hours, the chicks were moved to a temporary brooder under a red heat lamp where they will pass their next few days as pheasants of leisure. Meanwhile, I need to buckle down and put some real work into fox-proofing their long term accomodation. Using one of my wellies as cover, the little jills explored their first rabbit. The single greatest advance in the world of human technology was the invention of the wellington boot. Or so a ferret might argue. Playing with my two new jills in the garden this evening, I noticed that one of them was becoming increasingly vocal and shrill. Unsatisfied with tugging at my trouser leg, she started to clamber up and over my shoulder. Ferrets are seldom affectionate unless it suits their immediate ends, and it became obvious that this little beast was hungry. Having forgotten to get more kitten food, I decided to introduce them to rabbit. A ten minute walk up the road with the shotgun produced two bunnies, both of which were duly bagged and drawn. One was thrown in with the ever appreciative pair of silver hobs and was quickly dismantled, while the other was spread out on the lawn, ready for inspection by the new girls. Contrary to my expectations, they were horrified to meet their first rabbit. With characteristic ferret bravado, they didn’t want to admit their fear, but it was clear that all was not well. It suddenly occurred to me that placing two animals which have evolved to lurk in the shadows in the middle of an open lawn with an unfamiliar (and significantly larger) beast could well be an intimidating experience. They had nowhere to run, so they came to me. I took off a wellie boot and both immediately dashed into it and lurked in the toe, muttering and hissing to one another. I moved the wellie closer to the rabbit, and two little faces peeked out. From the security of the wellie, they felt confident enough to explore the rabbit, and within five minutes, one had latched on to the back of its head while the other was feasting on raw liver. 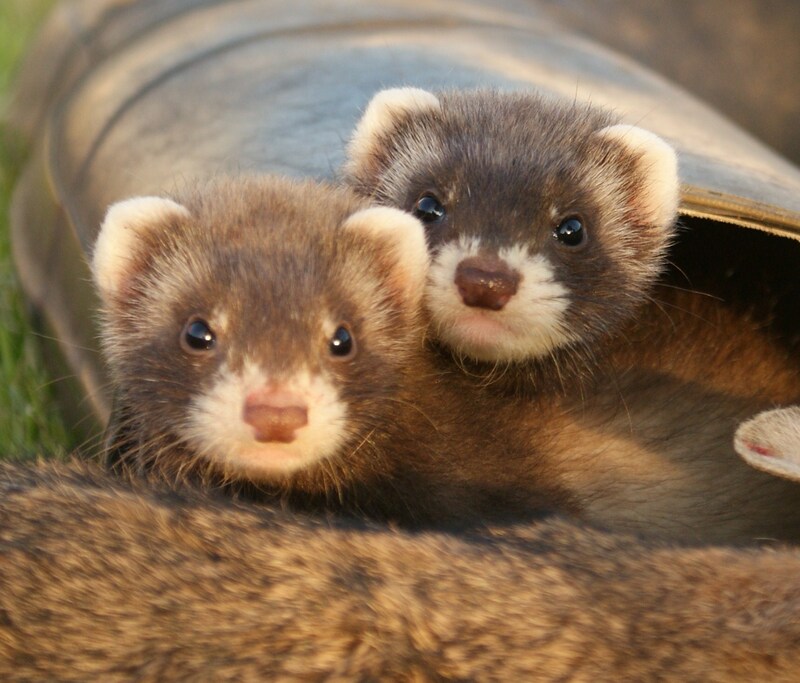 It makes sense that ferrets would love wellies. Dark, secretive corners must appeal to these fascinating little buggers, and now that my two have met their first rabbit, I hope that they will continue to explore their interest in holes. A greyhen with three chicks (just visible infront, behind and below her). She had five chicks in all, but the other two were ranging a few yards further ahead. After the depressing loss of my greyhen’s brood at the beginning of this month, I took the opportunity to cheer myself up today by visiting a friendly estate in the Borders where black grouse are highly prized and appear to be going from strength to strength. After a cup of coffee with the keeper, I set off onto the hill with my camera to a soundtrack provided by snipe, curlew and lapwings. Black grouse are now into their moult in southern Scotland and most are hiding in the deep cover, but it was immensely gratifying to see a greyhen with five chicks strolling happily through an area of rough pasture a few hundred yards away. I watched them for a while, and was pleased to see how gamely the little birds followed their mother through patches of young bracken. As a window of sunlight swept across the hill and lit up the little family, I took a series of photographs which I hope gives some idea of a brood in the wild. These birds looked about three weeks old, and now that they have survived their first few vulnerable days, they look set for success. The Snares of the Future? 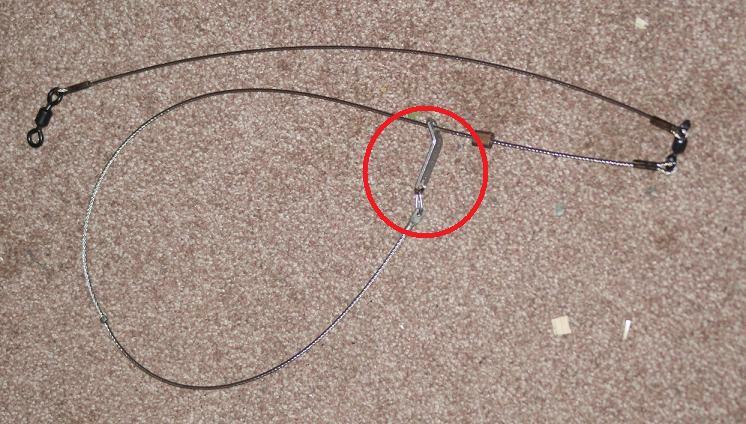 A Relax-A-Lock and a target specific breakaway loop (highlighted) built into a fox snare. I came across a huge variety of different snares when I sat my accreditation course last month, and wanting to find out more about some of the technology involved, I picked up a couple of GWCT designed snares last week. The GWCT have been great at researching alternatives and improvements to traditional snares in order to keep them relevant and progressive, and these snares are the culmination of several years of work. At a first glance the snares look very complicated, but if you aren’t dazzled by bells and whistles, it becomes clear that these traps are very similar to their forebears. The only difference is that they include two simple components which not only make them selective, but which actively help the snare to satisfy its legal purpose of holding a fox in one place until it can be despatched. The Relax-a-lock eye stops a fox from hurting itself on the wire, allowing the snare to sit in an uncomfortable but harmless loop around its neck. These simple little strips should be on every snare because they instantly eliminate the risk of suffering caused as a result of wire chafing and fraying. The breakaway loop is designed to snap when it’s pulled by a powerful badger, minimising the possibility of harming these ubiquitous non target species. If a badger does put his head through a snare, the wire loop will be broken and the lumbering oaf can waddle away from the scene without a backwards glance. After all, it’s far better to break a snare than break the law. This is clearly a huge step forward for a trap which is widely hated for its apparent inability to select appropriate victims. Thanks to a variety of different advances in snare making design, the days of the snare which killed and maimed will soon be over. We now have snares which are capable of self-releasing non-target species, and which simply hold a fox in one place until it can be killed. Legislation (particularly in Scotland) is so rigorous that even the slightest deviation from the letter of the law is punishable by extensive fines and the potential for a reduction in agricultural subsidy. What’s more, while the governments of both England and Scotland flatters themselves with thinking that they have scared keepers into compliance with the threat of punishment, in many cases, the changes are being accepted by a keeping community that is increasingly aware of technology and self motivated enough deal with progress. As a result, snares have never been more humane, selective and efficient. However, there is still a threat to snaring. These advanced snares are more than twice the price of legal but less well developed alternatives, so it is hard to see them being widely accepted with their current price tag. In addition, there is increasingly a feeling that even the most immaculately selective and benign snare would be rejected by governments which have been nagged into sickness by animal rights groups who refuse to accept that change has taken place. After three years spent researching upland birds and moorland management, one thing is absolutely clear amongst all this technical wrangling surrounding snares. Like them or loathe them, they kill foxes and help to create an environment in which biodiversity flourishes. This has been shown in any number of independent studies and surveys. In the absence of any practical alternative, a ban on snares would be a shocking blow to all groundnesting birds, particularly black grouse. After weeks of searching, I finally have the polecats I've always wanted. It’s been an extremely long day up in Glasgow, but before crashing out altogether, I wanted to celebrate the fact that this blog now has two new contributors. 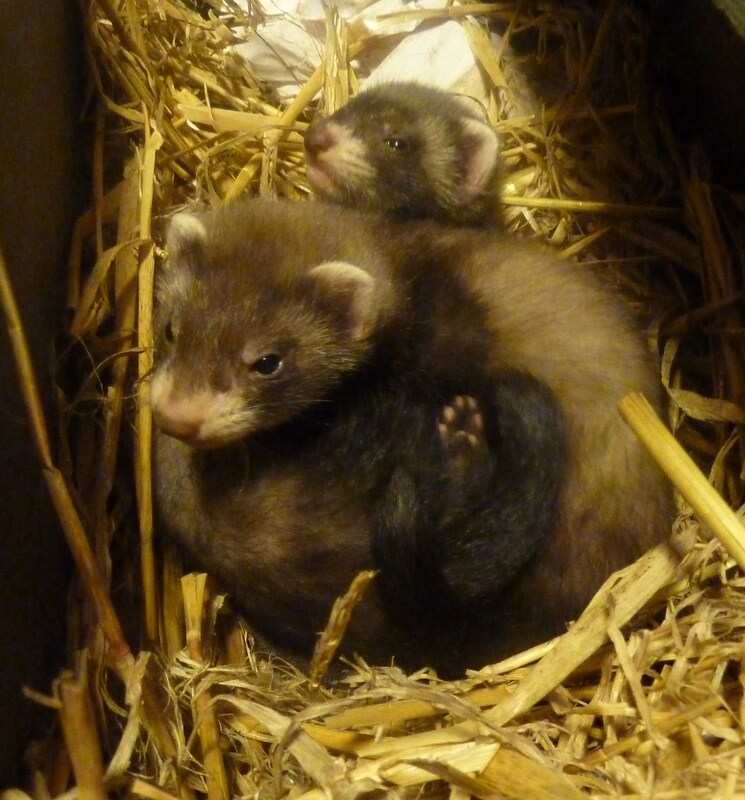 After an aeon spent searching through Stenhousemuir, Skinflats and Camelon for the location of a specific ferret breeder, my girlfriend and I finally managed to track him down and purchase a pair of seven week old jill ferrets. Without wishing to slight my silver ferrets, I’ve always wanted ferrets which were as physically close to wild polecats as possible. I think that I have finally suceeded, because not only are these terrific little brutes every bit as pretty as their wild counterparts, but they also seem to be just as coarse and as unmanageable. Within seconds of getting them home, they mauled my socks and carried out raids on my shoes. I simply can’t write any more today, but rest assured that these two little blighters will feature again on this blog soon. The sustained release of fresh bloodlines amongst Galloway's black grouse population could save our birds. Having travelled across the country last year researching the subject of black grouse, I came across some fascinating information. Perhaps most interesting of all is the work of a community group on the Isle of Arran which is dedicated to reintroducing black grouse to the island. After an absence of several years, the group was faced with all the problems associated with trying to create a new population of birds from scratch. Not only do black grouse have complex dietary requirements which makes rearing them like pheasants extremely difficult, but they are also hard-wired to wander and disperse far and wide. This latter issue makes keeping a breeding population together for any amount of time very difficult indeed, and while leks can be set up artificially, they seldom prove to be sustainable as young birds grow up and search for new breeding grounds elsewhere. Young greyhens will leave their family broods whether they have somewhere to go or not, and half of each lek’s chicks will vanish in the autumn. A reintroduction project needs to set up several interlinking leks if it ever hopes to sustain itself, because without somewhere for young greyhens to move to in their first year, it just becomes a matter of time before the project folds. Reintroduction in an environment where there are no local birds has been shown to be a tricky business. It is clearly not impossible, but in the name of a bird which many people view as nothing more than a pretty face, perhaps it doesn’t recieve the funding or research that it should. Less well documented is the same process of releasing hand reared birds in an environment in which black grouse still survive. Dumfries and Galloway’s population of black grouse is almost non-existent, and given that I have spoken to a number of people who have seen that greyhens failed to go down on their eggs properly this year, it could be that inbreeding is starting to take its toll. Brood sizes have been falling for the past few years across the county, and it could be that the local population is so scant that it is now killing itself. Theoretically, an infusion of hand reared birds could make a massive difference to the ailing population. Within a single generation, bloodlines could be revitalised and black grouse could be looking at making a resurgence. Not only would there be immediate improvements in genetic diversity, but many of the problems associated with reintroduction could be eliminated. Young greyhens conceived at artificial leks could move away to existing and natural leks, dispersing their genetic information in an active sense, rather than fading fruitlessly into the distance. Making the most tentative enquiries, I see that a release project in Galloway could be done. It would be costly and time consuming, and it would need to be done in the next five years, before inbreeding weakens the local population any further. A cynical part of me wonders why Galloway has no existing infrastructure to invest in black grouse. My “plan” to release birds is not exactly the most original or innovative, so why has nobody else thought of it? In reality, I suppose that it’s because Galloway is paying the price of being a quiet rural backwater. Any conservation investment would struggle to see a return because comparatively few people visit the county, and it would fail as an attraction for tourists. Contrary to crowing statistics published by the RSPB, the reintroduction of red kites has clearly failed to provide the county with anything like the intended boost to tourism, and public investment in a second major conservation project seems unlikely. Astonishingly, many of the private investors who should be involved in a project like this have no interest because they truly believe that black grouse died out in Galloway a long time ago. They have already given up, which is slightly shameful given that these are the people who grew up shooting blackgame. It’s a hell of a mountain to scale, but it could be that over the next few months, I start to put some thought and groundwork into an artificial release of black grouse in Galloway. Where are the bucks when you want them? Having concentrated so hard on the hill for the past few months, I thought that it was about time that I looked further afield for a change. As much as I love the heather, it’s nice to take a break and see Galloway from a different perspective, so with this in mind, I headed down to stay last night with my parents on their farm overlooking the Solway. 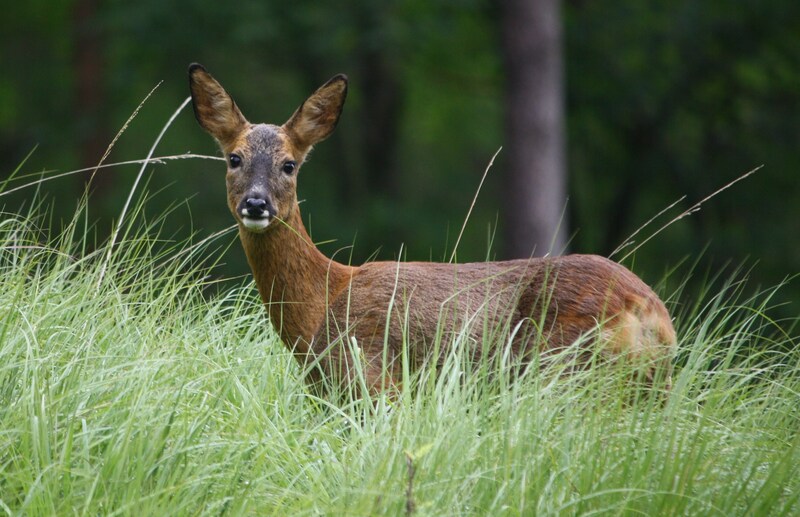 Their farm is a long narrow strip of pasture between two large walls of deciduous forest, and it is not at all uncommon to meet roe deer early in the morning as they browse away from the trees. True to form, I sprang to life at four o’clock this morning and headed out into the fields with the .243. Clouds covered the sunrise, but it was a rare treat to be up and about in the lowlands, dealing with terrain which has become unfamiliar since I started my project on the Chayne. Knee deep silage fields soaked my trousers, and I weaved a way through the familiar copses and stands of gorse overlooking the muddy Solway Firth as the clouds brightened. I spotted a roe doe feeding in a field of potatoes on the neighbour’s property, then followed a narrow line between the hedgerows as I walked on to a likely spot for a buck. As it started to rain, the dog roses and honeysuckles seemed to sag luxuriously into the vibrant walls of blackthorn and hawthorn. The hedges are seldom cut on my parents’ farm, and the advantages are easy to see. The typical “box” hedge has been allowed to straddle into a large and unruly tangle of stems and bracken, mixed with wildflowers and the tips of hare’s ears. Nearing my destination, I heard a heavy rustle on the hill beside me. I couldn’t see a thing through the thick undergrowth, but I was certain that I was being watched. A cluster of oak trees swayed in the soft rain, and then a gruff bark rang through the birdsong. The game was up. A fine big roe buck cantered up the hill, revealing himself in patches of foxy red. He stopped and barked again, following the exclamation with a series of shorter coughs. The sodden vegetation echoed his call and pumped it out of the wood towards me. It was five fifteen, and I headed back to bed with a smile on my face. Soaking wet and unsuccessful, I was surprised to find myself thinking that I couldn’t have planned a better morning.